Joleon Patrick Lescott (born 16 August 1982) is a former English professional footballer. He played as a centre back, though he occasionally played in various other positions across the defensive line, including left back. He currently works as a loanee player liaison agent for Manchester City, for whom he also played for five seasons. Born in Birmingham, Lescott is a graduate of the Wolverhampton Wanderers youth academy. He made his first-team debut with Wolves in 2000 and he was named the supporters' Young Player of the Year two years running. He was a regular player as the club won promotion to Premier League in 2003, but missed the whole season through injury and they were relegated. He was named in the Championship team of the year for the 2005–06 season, and subsequently moved to Premier League club Everton for a total of £5 million in August 2006. He was voted Player's Player of the Season by his teammates in the following two seasons. Lescott moved to Manchester City in August 2009 for a reported £22 million and spent five seasons at the club, winning two league titles, an FA Cup and a League Cup. After his release in 2014, he joined West Bromwich Albion on a free transfer and Aston Villa a year later. Internationally, Lescott represented England at various youth levels before making his senior debut in 2007 against Estonia in the UEFA Euro 2008 qualifiers. He represented the country at UEFA Euro 2012, scoring England's first goal of the tournament in their opening match, a 1–1 draw against France. Lescott grew up in the Quinton area of Birmingham, where he attended the Four Dwellings High School. When he was five years old, Lescott was struck by a car outside his primary school, suffering severe head injuries leaving scarring on his forehead and hairline. His first-team debut for Wolverhampton Wanderers came as a 17-year-old in the 2000–01 season against Sheffield Wednesday at Molineux on 13 August 2000. At the end of his first season, Lescott was named the Supporters' Young Player of the Year by the Wolves fans; an award he also won in the subsequent 2001–02 season. Lescott started to become a regular fixture in the Wolves team. During the 2002–03 season he missed only one league match and played in each of the club's FA Cup fixtures. He was a member of the team that beat Sheffield United 3–0 at the Millennium Stadium in the 2003 First Division play-off Final to win promotion to the Premier League for the 2003–04 season. Despite Wolves gaining promotion, Lescott along with Matt Murray was unable to participate in the 2003–04 season due to knee surgery, preventing him from competing in the Premier League. Wolves were subsequently relegated and, upon completing his rehabilitation, Lescott returned to compete in the Championship. In October 2005, Lescott agreed a two-and-a-half-year extension to his contract at Wolves. At the conclusion of the 2005–06 season, he was named in the Championship PFA Team of the Year. Lescott was sold to Everton at the start of the 2006–07 season for an immediate payment of £2 million, followed by a further £2 million paid in instalments and a final £1 million contingent on appearances. The transfer was slightly delayed as Everton asked for extra medical checks to be taken on Lescott's knee following the reconstruction of the joint earlier in his career. Lescott made his Everton debut in August 2006 during a victory over Watford and his first start of the season away to Tottenham Hotspur, after Alan Stubbs injured his groin in the previous match against Blackburn Rovers. The match was Everton's first victory at White Hart Lane in two decades, and Lescott was named man of the match. Lescott started again in the next match, the 204th Merseyside derby, a 3–0 victory for Everton. Lescott's first Everton goal came in a 1–1 draw against Aston Villa at Villa Park on 2 April 2007. Lescott was voted the Players' Player of the Season for 2006–07 by his teammates. He also finished second behind Mikel Arteta in the Fans' Player of the Season. The start of the 2007–08 season saw Lescott score three goals in the first eight matches of the season. He did not quite manage to continue scoring at that rate, but he ended the campaign with 10 goals in all competitions and the highest shot-to-goal ratio in the Premier League: 42.1%. At the end of season awards, Lescott was voted Everton's Player of the Season and Players' Player of the Season. Prior to the final home match of the season against Newcastle, on 11 May 2008, Lescott was also awarded the Player of the Year award by the Everton Disabled Supporters Association. The EDSA labelled Lescott "Mr Consistency" for his performances over the 2007–08 season. He is also only the second Everton player to have ever been awarded the honour twice. The start of the 2007–08 season saw Lescott move to the left-back position after Joseph Yobo and Phil Jagielka's successful partnership at the centre of Everton's defence provided manager David Moyes with a selection dilemma. On 7 December 2008, Lescott played superbly against Aston Villa scoring two goals, even though Everton lost 3–2. On 25 January 2009, Lescott scored Everton's only goal – a close-range header – in the FA Cup fourth round meeting with Liverpool. The match ended as a 1–1 draw, but Everton went through by scoring the replay's only goal in extra-time on 4 February. Lescott played for Everton in the 2009 FA Cup Final at Wembley Stadium on 30 May, resulting in a 2–1 defeat to Chelsea. Following the end of the 2008–09 season, Manchester City attempted to sign Lescott, but Everton publicly rejected two offers from the club. On 11 August 2009, Lescott submitted a formal written transfer request, which was immediately rejected by Everton. Manager David Moyes refused a request from Lescott to be taken out of the squad for the first home match of the season, a 6–1 defeat to Arsenal. Lescott received a mixed reaction from Evertonians when the teams were announced on the PA system. The ongoing saga finally came to an end when Lescott moved to Manchester City for a fee speculated to be £22 million with Lescott signing a five-year contract with the club on 25 August 2009. Lescott made his debut for City on 27 August in a 2–0 League Cup away victory over Crystal Palace and scored his first City goal in a 2–2 draw with Fulham on 25 October 2009. Lescott's first season and a half proved to be a frustrating time for the defender with him struggling to find the form he had shown at Everton, along with picking up a number of injuries, which included re-injuring his knee after hyper-extending it in a 3–3 away draw with Bolton Wanderers. Pundits and journalists alike felt Lescott was finding the pressure of performing after the big fee City had spent to bring him to the club difficult. Roberto Mancini replaced Mark Hughes as manager in December 2009 and preferred Lescott after his return from injury to Kolo Touré to partner the fast improving Vincent Kompany for a few months which in this time, including an impressive 4–2 win over Chelsea at Stamford Bridge in March 2010. With Lescott finally showing good form he would once again find himself frustrated after picking up another niggling injury, which would see him struggle to get back into the team in his preferred central defensive role for the foreseeable future. On 28 December 2010, Lescott scored a header, City's first of the season, in the 4–0 victory over Aston Villa at the City of Manchester Stadium, but during the January 2011 transfer window, with Lescott making few first-team appearances during the first half of the 2010–11 season, there was speculation that he would be moving back to Wolverhampton Wanderers on loan, Roberto Mancini however continually insisted that Lescott was a part of his plans. In February 2011, Kolo Touré was suspended for failing a drug test, this would represent a huge opportunity for Lescott who was reinstalled as the partner of Kompany in central defence. Lescott went from strength to strength as the two formed a formidable defensive partnership. On 17 April 2011, he started and played the full 90 minutes against Manchester United in the 1–0 FA Cup semi-final victory at Wembley Stadium as City reached their first major-final since 1981. On 25 April, eight days after that win over their rivals, Lescott partnered Kompany again in an important match against Blackburn Rovers at Ewood Park and completing the full 90 minutes in a 1–0 win, also making his 30th appearance of the season for City in the process. Lescott was part of the Manchester City team that won the FA Cup, beating Stoke City 1–0 in the final at Wembley Stadium and ending a 35-year wait for a major trophy in the process. He would also score two more headers in the final two matches of the season, in a 3–0 win against Stoke City three days later and also against Bolton Wanderers in a 2–0 win, as City ended the season in third position and qualified for the UEFA Champions League for the first time. On 7 August 2011, in the 2011 FA Community Shield at Wembley Stadium, Lescott scored in a 3–2 loss against Manchester United. This would prove to be City's last defeat on English soil until a 2–1 defeat by Chelsea on 12 December. During this time, Lescott firmly established himself as a vital part of the team in defence as City recorded 5–1 and 6–1 away victories over Tottenham and Manchester United respectively, in which Lescott started both and assisted a goal in the victory over United. Lescott scored an own goal in a 1–1 draw with Liverpool at Anfield in November but continued to show strong form throughout the season. Lescott also made his Champions League debut against Napoli, though City failed to progress past the group stages. On 22 January 2012, Lescott scored a goal in a 3–2 win against Tottenham, giving City a 2–0 lead at the time. He was an unused substitute as City were beaten 1–0 by Wigan Athletic in the 2013 FA Cup Final at Wembley Stadium on 11 May. In 2014, Lescott was reportedly offered the chance to leave Manchester City with clubs such as West Ham being linked as prospective destinations, and a deal being agreed at one point. However, Lescott turned down a move to "win trophies" before seeing what happened at the end of the season. Lescott fulfilled his wishes, winning the League Cup and the 2013–14 Premier League. On 24 May 2014, Lescott was released by City. Despite interest from Hull City and Stoke City, on 20 June 2014, Lescott signed for West Bromwich Albion for free on a Bosman transfer, signing a two-year contract with the option of a further year. He was the first signing for the club by Alan Irvine, with whom he had previously worked at Everton, and he also knew his assistant Rob Kelly from Wolves. He scored his first goal in a 3–2 defeat against Queens Park Rangers. Following six clean sheets in only ten matches under new manager Tony Pulis, Lescott was praised by the fans with some calling for a call-up back into the England squad. On 1 September 2015, Lescott signed for fellow Premier League club Aston Villa. When signing for Villa, Lescott revealed to the Birmingham Mail he has been an Aston Villa fan from a young age. Lescott made his debut twelve days later, playing the entirety of a 3–2 loss away to Leicester City. On 5 December, he scored his first goal for Villa, finishing Jordan Veretout's corner kick to open a 1–1 draw at Southampton. Lescott scored again for The Villans when another of his headers was fumbled by Wayne Hennessey in what proved to be the only goal in a 1–0 win over Crystal Palace on 12 January 2016, just the team's second win of the 2015–16 season and first of 20 matches, and their first clean sheet since 8 November. On 6 February 2016, Lescott was on the score sheet again in a 2–0 victory over Norwich City, his header finding its way past Declan Rudd from Carles Gil's corner. Eight days later, after last-placed Villa lost 0–6 at home to Liverpool, Lescott drew the ire of fans when he tweeted a picture of a luxury car. He later claimed that this was an accident when his mobile was in his pocket, and apologised for the performance. In a season that ended with relegation, Lescott's performances, efforts and attitude were criticised by the fans and press. In April 2016, Lescott again angered fans with controversial comments following the club's confirmed relegation to the Championship after losing to Manchester United. He described the relegation as "a weight off the shoulders" and that they "can give these fans what they deserve – some performances". He was also heavily criticised by former Villa players Stan Collymore and Paul McGrath for the remarks. On 29 August 2016, Lescott joined Superleague Greece club AEK Athens on a two-year contract. The 34-year-old defender suffered a detached cartilage in his knee while cycling in his apartment. The injury ruled Lescott out for the remainder of the season. The player refused to get help from the team's doctors and insisted on completing his rehabilitation in the UK. AEK Athens did not agree to the player's wishes and additional demands, which resulted in his contract being terminated on 14 November 2016 by mutual consent. On 24 January 2017, Sunderland signed Lescott on a short-term contract until the end of the season. His departure was confirmed on 9 June 2017. Lescott has represented England at under-18, under-20, under-21 and B levels. After his first season for Everton, Lescott made his England B debut against Albania at Burnley's Turf Moor on 25 May 2007, he replaced Reading's Nicky Shorey in the 74th minute. On 3 September 2007, Lescott received a call-up to Steve McClaren's England squad for the UEFA Euro 2008 qualifiers with Israel and Russia. Lescott made his international senior debut against Estonia on 13 October 2007 – replacing Rio Ferdinand at half-time – with England winning 3–0. His second cap – and first start – was the UEFA Euro 2008 qualifier against Russia, which England lost 2–1. Lescott made his first England appearance under the management of Fabio Capello on 26 March 2008 in a friendly match against France, coming on as a substitute at half time for the captain John Terry. He made two appearances in qualifying for the 2010 FIFA World Cup, but injury prevented him from being part of the squad for the finals. Lescott was a regular member of the England squad during qualification for UEFA Euro 2012 and was named in Roy Hodgson's 23-man squad for the tournament. On 11 June 2012, he scored his first international goal for England with a header against France in England's opening match of UEFA Euro 2012. In April 2012, Lescott, his brother Aaron Lescott, and San Jose Earthquakes defender Jordan Stewart launched a fashion line of high end designer clothes called "The Lescott Stewart Collection." 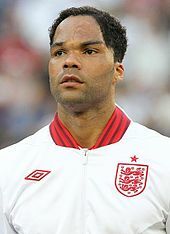 Lescott is a cousin of British boxer Brian Rose. The pair were featured together on Sky Sports' Ringside programme in April 2013. As of match played 26 March 2013. England score listed first, score column indicates score after each Lescott goal. ^ a b Hugman, Barry J., ed. (2010). The PFA Footballers' Who's Who 2010–11. Edinburgh: Mainstream Publishing. p. 250. ISBN 978-1-84596-601-0. ^ "Joleon Lescott". 11v11.com. AFS Enterprises. Retrieved 11 December 2017. ^ "Pablo Marí: "La diferencia que hay en España entre Primera y Segunda B está en una sola liga"" [Pablo Marí: "The difference that there is in Spain between La Liga and the Segunda B is in a single league"]. Diario AS (in Spanish). 13 April 2018. Retrieved 18 April 2018. ^ Maddock, David (29 April 2008). "Joleon Lescott is praying for Everton UEFA Cup berth". Daily Mirror. London. ^ Daly, James (25 November 2006). "Joleon Lescott: 'The accident made me more determined to make the most of what I have, but my brother has probably been the greater inspiration ...'". The Independent. London. Retrieved 19 May 2012. ^ a b "Games played by Joleon Lescott in 2000/2001". Soccerbase. Centurycomm. Retrieved 27 April 2016. ^ a b "Wolves back in big time". BBC Sport. 26 May 2003. Retrieved 11 December 2017. ^ a b "Gerrard named player of the year". BBC Sport. 23 April 2006. Retrieved 11 December 2017. ^ "Lescott completes Everton switch". BBC Sport. 14 June 2006. Retrieved 7 January 2007. ^ a b c d e "Awards winners". Everton F.C. Retrieved 11 December 2017. ^ Doyle, Paul (14 May 2008). "Stats entertainment: Lescott the goal machine and other curios". The Guardian. London. Retrieved 7 May 2010. ^ Bailey, Richard (7 December 2008) "Young double sinks Everton" Archived 20 December 2008 at the Wayback Machine. Sky Sports. ^ McNulty, Phil (25 January 2009) "Liverpool 1–1 Everton". BBC Sport. ^ a b Beavan, Chris (30 May 2009). "Chelsea 2–1 Everton". BBC Sport. Retrieved 11 December 2017. ^ "Lescott completes Man City move". BBC Sport. 25 August 2009. Retrieved 28 April 2016. ^ "Football News – all the latest breaking football stories". Daily Mirror. London. Retrieved 28 April 2016. ^ "Lescott completes move to City". Manchester City F.C. 25 August 2009. Retrieved 26 August 2009. ^ "Mark Hughes Happy To Hand Joleon Lescott His Manchester City Debut in League Cup". Goal.com. 28 August 2009. Retrieved 28 April 2016. ^ Dawkes, Phil (25 October 2009). "Man City 2–2 Fulham". BBC Sport. Retrieved 25 October 2009. ^ Hughes, Ian (15 August 2009). "Blackburn 0–2 Man City". BBC Sport. Retrieved 23 March 2013. ^ Pugsley, Danny (23 February 2011). "Defensive partnerships and the presence of Vincent Kompany". Bitter and Blue. Retrieved 23 March 2013. ^ "On the ball: Vincent Kompany salutes Joleon Lescott nous". Manchester Evening News. 21 March 2011. Retrieved 23 March 2013. ^ a b McNulty, Phil (14 May 2011). "Man City 1–0 Stoke". BBC Sport. Retrieved 11 December 2017. ^ a b Bevan, Chris (7 August 2011). "Manchester City 2–3 Manchester United". BBC Sport. Retrieved 11 December 2017. ^ "Man City 3–2 Tottenham". BBC Sport. 22 January 2012. Retrieved 22 January 2012. ^ a b McNulty, Phil (11 May 2013). "Manchester City 0–1 Wigan Athletic". BBC Sport. Retrieved 11 December 2017. ^ "West Ham agree deal with Manchester City to take Joleon Lescott for £90,000 per week". The Daily Telegraph. London. 11 January 2014. Retrieved 11 January 2014. ^ "Lescott: I snubbed January move for glorious end at City". Manchester Evening News. 21 February 2014. Retrieved 21 February 2014. ^ a b McNulty, Phil (2 March 2014). "Manchester City 3–1 Sunderland". BBC Sport. Retrieved 11 December 2017. ^ a b c "Joleon Lescott: Overview". Premier League. Retrieved 11 December 2017. ^ "Clubs submit retained and released lists". Premier League. Archived from the original on 4 May 2015. Retrieved 28 April 2016. ^ "Joleon Lescott: West Brom sign England defender". BBC Sport. 20 June 2014. Retrieved 23 June 2014. ^ "QPR 3–2 West Brom". BBC Sport. 20 December 2014. Retrieved 20 December 2014. ^ "West Brom fans react on Twitter to Joleon Lescott's performance v Southampton". Hereisthecity.com. 28 February 2015. Retrieved 28 April 2016. ^ "Joleon Lescott: Aston Villa sign West Brom defender". BBC Sport. 1 September 2015. Retrieved 1 September 2015. ^ Evans, Gregg (1 September 2015). "Joleon Lescott on being an Aston Villa fan, being rejected by his boyhood club, Muller shirts and Dalian Atkinson". Birmingham Mail. Retrieved 28 April 2016. ^ Sanghera, Mandeep (5 December 2015). "Southampton 1–1 Aston Villa". BBC Sport. Retrieved 13 January 2016. ^ "Wayne Hennessey mistake sees Aston Villa beat Crystal Palace". PA Sports. ESPN FC. 12 January 2016. Retrieved 12 January 2016. ^ Johnston, Neil (12 January 2016). "Aston Villa 1–0 Crystal Palace". BBC Sport. Retrieved 13 January 2016. ^ "Aston Villa 2–0 Norwich City". BBC Sport. 6 February 2016. Retrieved 6 February 2016. ^ "Joleon Lescott: Aston Villa player sorry for 'pocket' tweet". BBC Sport. 15 February 2016. Retrieved 15 February 2016. ^ "Aston Villa relegated: Randy Lerner? Tom Fox? Tim Sherwood? Who is to blame for Premier League relegation?". Metro. London. 16 April 2016. Retrieved 16 April 2016. Lescott has had a shocker ... Micah Richards, Joleon Lescott, Kieran Richardson and Gabriel Agbonlahor are experienced players who have simply let the club down. ^ "Aston Villa blog: An 'open letter' to the players". Birmingham Mail. 15 April 2016. Retrieved 16 April 2016. Joleon Lescott, a Villa fan (allegedly), captained our club again at the weekend, a catastrophic signing both on and off the pitch. I'm aware I don't see what goes on at Bodymoor Heath every day (if anything) but you seem more interested in arguing with and insulting the fans than doing your job on the pitch. I wish you were as fast as that car you tweeted out. ^ "Under-fire Villa players told to take the flak". Express & Star. Wolverhampton. 15 April 2016. Retrieved 16 April 2016. Brad Guzan, Joleon Lescott and Leandro Bacuna have been among several members of the squad increasingly targeted by supporters as Villa have slid toward the Championship. ^ "Joleon Lescott: Aston Villa defender criticised for relegation comment". BBC Sport. 17 April 2016. Retrieved 28 April 2016. ^ "Η ΑΕΚ καλωσορίζει τον Τζόλεον Λέσκοτ! < ΕΙΔΗΣΕΙΣ | AEK F.C. Official Web Site". AEK Athens F.C. Retrieved 29 August 2016. ^ "Joleon Lescott leaves AEK Athens after less than three months". ESPN FC. 24 November 2016. Retrieved 24 November 2016. ^ "Sunderland complete Lescott signing". Sunderland A.F.C. Retrieved 24 January 2017. ^ "Zlatan Ibrahimovic's Manchester United release confirmed by Premier League". The Guardian. London. 9 June 2017. Retrieved 9 June 2017. ^ "England B 3–1 Albania". BBC Sport. 26 May 2007. Retrieved 30 May 2007. ^ "Lescott called up". The Football Association. ^ "England World Cup squad: Cappello calls up Carragher and King". The Scotsman. Edinburghw. 11 May 2010. Retrieved 26 May 2012. ^ "John Terry named in England squad for Euro 2012 finals; Andy Carroll and Alex Oxlade-Chamberlain also make cut". The Daily Telegraph. London. 16 May 2012. Retrieved 26 May 2012. ^ a b McNulty, Phil (11 June 2012) "Euro 2012: France 1–1 England". BBC Sport. Retrieved 27 April 2016. ^ "Clothing Launch: Joleon Lescott & The Lescott Stewart Collection". Kickette. Archived from the original on 8 October 2012. Retrieved 9 January 2013. ^ "Games played by Joleon Lescott in 1999/2000". Soccerbase. Centurycomm. Retrieved 27 April 2016. ^ "Games played by Joleon Lescott in 2001/2002". Soccerbase. Centurycomm. Retrieved 14 March 2014. ^ "Games played by Joleon Lescott in 2002/2003". Soccerbase. Centurycomm. Retrieved 27 April 2016. ^ "Games played by Joleon Lescott in 2003/2004". Soccerbase. Centurycomm. Retrieved 27 April 2016. ^ "Games played by Joleon Lescott in 2004/2005". Soccerbase. Centurycomm. Retrieved 14 March 2014. ^ "Games played by Joleon Lescott in 2005/2006". Soccerbase. Centurycomm. Retrieved 14 March 2014. ^ "Games played by Joleon Lescott in 2006/2007". Soccerbase. Centurycomm. Retrieved 14 March 2014. ^ "Games played by Joleon Lescott in 2007/2008". Soccerbase. Centurycomm. Retrieved 14 March 2014. ^ "Games played by Joleon Lescott in 2008/2009". Soccerbase. Centurycomm. Retrieved 14 March 2014. ^ a b "Games played by Joleon Lescott in 2009/2010". Soccerbase. Centurycomm. Retrieved 14 March 2014. ^ "Games played by Joleon Lescott in 2010/2011". Soccerbase. Centurycomm. Retrieved 14 March 2014. ^ "Games played by Joleon Lescott in 2011/2012". Soccerbase. Centurycomm. Retrieved 14 March 2014. ^ "Games played by Joleon Lescott in 2012/2013". Soccerbase. Centurycomm. Retrieved 14 March 2014. ^ "Games played by Joleon Lescott in 2013/2014". Soccerbase. Centurycomm. Retrieved 27 April 2016. ^ "Games played by Joleon Lescott in 2014/2015". Soccerbase. Centurycomm. Retrieved 27 April 2016. ^ a b "Games played by Joleon Lescott in 2015/2016". Soccerbase. Centurycomm. Retrieved 1 June 2016. ^ a b "Games played by Joleon Lescott in 2016/2017". Soccerbase. Centurycomm. Retrieved 8 September 2017. ^ "J. Lescott". Soccerway. Perform Group. Retrieved 14 April 2017. ^ a b "Lescott, Joleon". National Football Teams. Benjamin Strack-Zimmerman. Retrieved 28 November 2017. ^ "Top three dominate". BBC Sport. 15 April 2002. Retrieved 11 December 2017. ^ McKechnie, David (28 April 2003). "Henry lands PFA award". The Guardian. London. Retrieved 11 December 2017. ^ a b "Player of the Year". Wolvesheroes.com. Retrieved 11 December 2017. Wikimedia Commons has media related to Joleon Lescott. This page was last edited on 19 April 2019, at 12:15 (UTC).